Know anything more about the Xerox 4045? Contact Us! 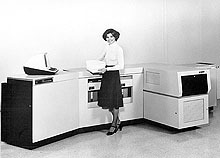 Elixir Technologies Corporation, one of the first companies to create software on a standard PC to design forms, fonts and graphics for the 4045 as a proof printer. See our pages on the history of Elixir and one of its competitors, TyRego. The Xerox 9700, big brother to the 4045.